You know how you sometimes look back to the past and wish you could have done something in your life differently? 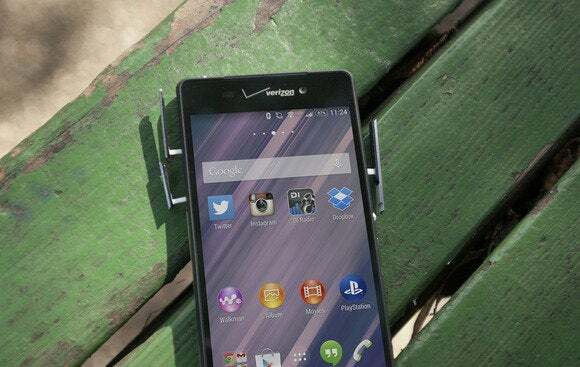 Sony sort of pulled the same schtick with its new flagship, the Xperia Z3v. The Xperia Z2 was supposed to be its big flagship phone of the year, but this new phone is making us wonder why it didn’t just wait to release this instead. Hopefully you didn’t just buy the Xperia Z2, because the Z3v is just a bit better in every way—and it’s exclusive to Verizon, a carrier other than T-Mobile, which the company has been tied to at the hip all this time. Its powerful hardware and neat bundled features are also a perfect example of what Sony is capable of when it takes its time with a product. The Xperia Z3v comes dressed up in Sony’s signature “Omni-Balance” design motif—the same one it’s been using for a few years now. At first glance, the glass-covered chassis is almost indistinguishable from its predecessor—from any of its predecessors, really—and about the only noticeable difference is the rubbery polymer coating around its edges. What’s worse: It’s actually different from the Xperia Z3 announced in September at IFA, which has a metal band around its edges. I’m struggling to understand the thought that went behind manufacturing a different chassis for the Verizon variant of this phone, and as a Verizon subscriber I’m especially bummed that I don’t have the option to purchase the more premium-feeling version. All about that bass—er, backside. The Xperia Z3v’s 5.2-inch 1080p display is powered by Sony’s proprietary Triluminous LCD display technology, which kicks elements like color and saturation up a notch, as well as the X-Reality image processing engine, which is fancy marketing speak for a feature that sharpens edges, eliminates missing pixels, and boosts the richness of colors, even for low-quality black market video content. It also lets you adjust the color tone and white balance of the smartphone’s screen as you see fit—kind of like how you’d adjust the color settings on your TV. Sony lets you customize the white balance settings on your Xperia display. The display features a pixel density of about 424 pixels per inch, which puts it right behind the Samsung Galaxy S5 and HTC One (M8). It’s one of the brightest displays I’ve ever seen, though not nearly as bright as the Super AMOLED on Samsung’s latest smartphones. It was also surprisingly legible out in bright sunlight with the display brightness turned all the way up. Water can’t hurt the Z3v. Like the rest of the Sony device family, the Xperia Z3 is both water and dust proof. Sony made the right move by jumping on the “life proof” bandwagon early, even though that shiny glass chassis is hardly the type of thing you want to take out with you on the old dusty trail. Also, while the flaps that protect the charging port and MicroSD and SIM slots are necessary, they’re still very annoying to deal with. Ladies, you will chip regular nail polish opening the ports every day, so plan to invest in gel manicures if you stick with this phone. Sony packed the Xperia Z3v with a 2.5GHz Qualcomm Snapdragon 801 processor and 3GB of RAM. It’s one of the fastest mobile chips on the market right now, so you won’t have to worry too much about app slowdowns and gaming lag. I have no means of knowing what it is like after six months of use, but the interface seems light enough that it won’t bog down the system. 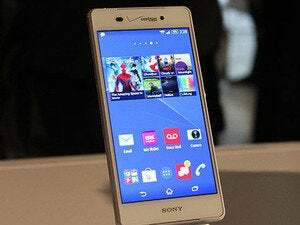 Beginning November 2014, after the PlayStation 4 gets a software update, the Xperia Z3v will support Remote Play. This will essentially enable you to play PlayStation 4 games on the device over Wi-Fi, like the PS Vita does now. You’ll also be able to purchase a DualShock controller mount for the device to complete the console-like gaming experience. I couldn’t test this ability at the time of review, but when the feature is officially out we’ll have a full run-through for you. A phone that’s ready for games. The Xperia Z3v’s mobile gaming experience is made better by the fact that the device is equipped with ample front-facing stereo speakers, which sound just as good at the HTC One’s—I really appreciate that manufacturers are paying more attention to a smartphone’s external audio abilities as much as everything else. I streamed the BBC World Broadcast via TuneIn radio in my living room the other night and could hear it perfectly as I moved throughout the house, cleaning things and whatnot. The Z3v’s battery life, on the other hand, is about average for a high-powered smartphone with a high definition display. If you tend to switch between streaming music, snapping photos, and incessantly refreshing your Twitter feed, the 3,200mAh will get you through most of the day—at least until you get home from work. It does much better on standby, when you’re hardly interacting with it, at which it lasted about two days before I saw a significant drop in battery percentage. 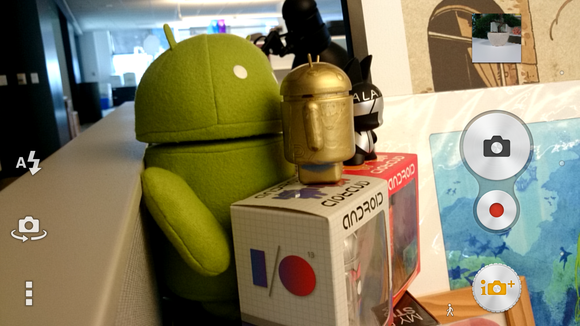 The Xperia Z3v’s camera interface is pretty self explanatory. If you’re in the market for a phone that doubles as a camera, the Xperia Z3v is worth your consideration. It has a physical camera button, which makes the smartphone actually feel like a camera and helps inspire spontaneous snapping sessions. Its 20.7-megapixel camera sensor also takes some very impressive photos where there’s ample lighting. The controls are also easy to use—all you have to do is fire up the camera app and the software will automatically adjust the settings for you. There are plenty of shooting modes, like a Manual mode, a Multi-camera mode, and even 4K video recording. 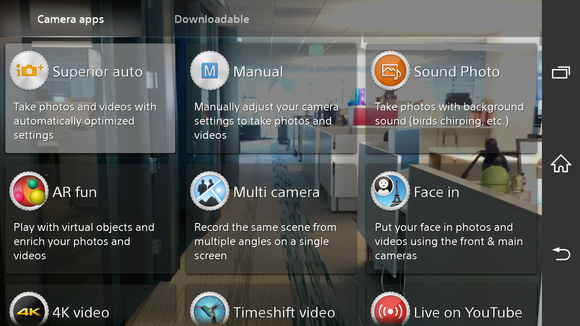 If you’re really into camera features, you can download more from Sony’s little pop-up plug-in page. Like those extra camera apps? Sony’s got plenty of ‘em. The Xperia Z3v does get a bit inconsistent when it comes to low-light photography, especially if you’re shooting with flash. I took three photos in a row in a dimly lit room with the automatic flash on, and the first two photos were completely blown out. Three photos taken in rapid succession with the flash on, one after the other, and they all came out looking vastly different. Also, I wasn’t too keen on the green-hued color palette with the flash turned off. The Z3v’s camera performs best when it’s out in natural light. The beautiful San Francisco-Oakland Bay Bridge. Unfortunately, Sony’s digital zoom doesn’t do it much justice to it. Enlarge to see what I’m talking about. 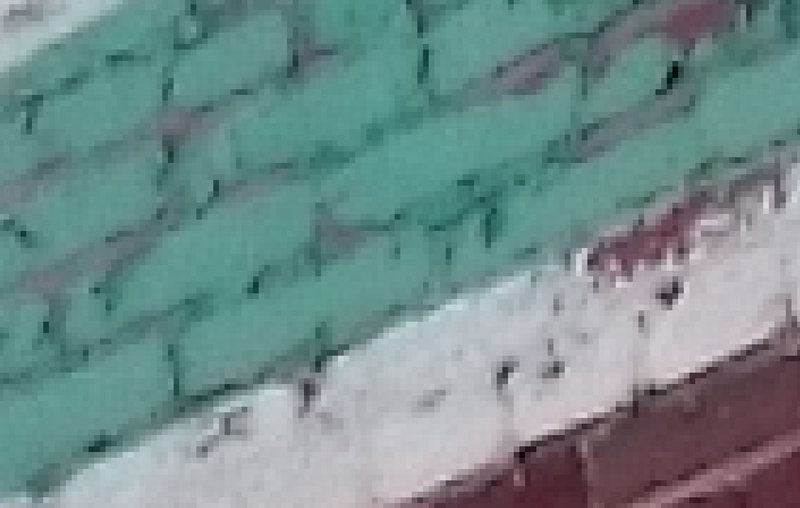 The Xperia Z3v also suffers from bad compression artifacts, wherein neighboring pixels blend together as if they were melted candle wax or something. It’s only obvious when you zoom all the way in on a photo, but it could be a problem if you use your phone to capture long-lasting memories that you want to edit later. Cool photo from afar, bro! But up close it’s like smudged crayon. Xperia Z3v’s Lock and Home screen. 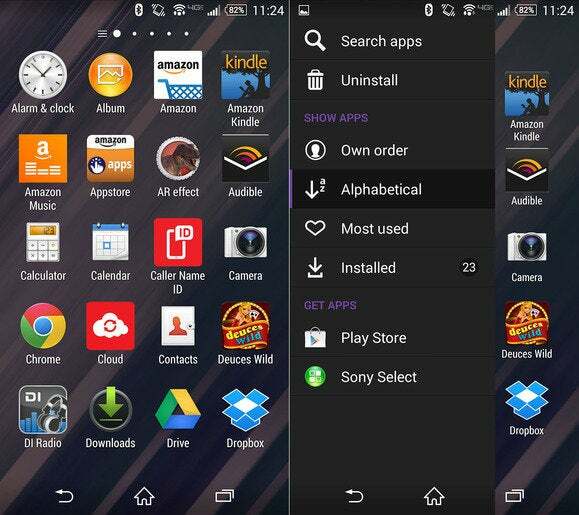 The Xperia Z3v runs a skinned version of KitKat. The company has yet to mention when the Lollipop update will rollout. I’ve already mentioned some of Sony’s neat bundled features, like the PlayStation 4 Remote Play and software that lets you adjust the display hardware, but there are a few other apps the phone comes bundled with too, including Albums, Walkman, and Movies. Sony also offers an unlimited subscription service of sorts for its entertainment suite of apps, but as it comes packed alongside the Google suite of apps and Google Play Music’s unlimited streaming service it all just feels so redundant. Sony’s Android user interface isn’t as intense as LG’s or Samsung’s, which is nice, but it does come with a few idiosyncrasies that might annoy you—they got to me in just a few days. One of the most notable is the way that the Xperia interface handles pinning apps to the Home screen—rather than just allowing you to drag the app from the application drawer and then taking you to the Home screen, you have to drag it up until the Add to Home screen module pops up and then place it. However, I do like the little slide-out option panel that exists in the app drawer—it lets you categorize apps to your liking and search for those you just can’t seem to locate. I’m interested to see what Sony does with Android Lollipop and Material Design, especially since its interface aesthetics haven’t changed much over the last year and a half or so. Overall, Sony’s Xperia Z3v is a phone that’s more suited for entertainment than some of the other offerings out there because of its direct link to the movie, music, and gaming worlds. Its app offerings may seem redundant, but they’re there to remind Android users that Sony is a powerful company with a dozen hands in different pots. That’s also to its detriment, however—or at least, it has been in years past. Its smartphone business has felt a bit stale since it adopted Android as its operating system, but now it’s more consistently putting out solid devices. We’ve seen what Sony is capable of putting out, and now it’s up to the company to gets its devices into more hands.